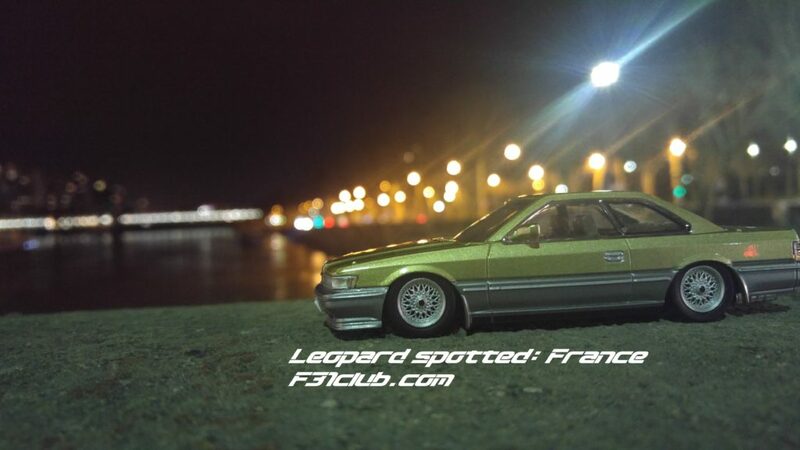 It is always hard to do things and make sure it intersects with F31club in some shape, way or form. 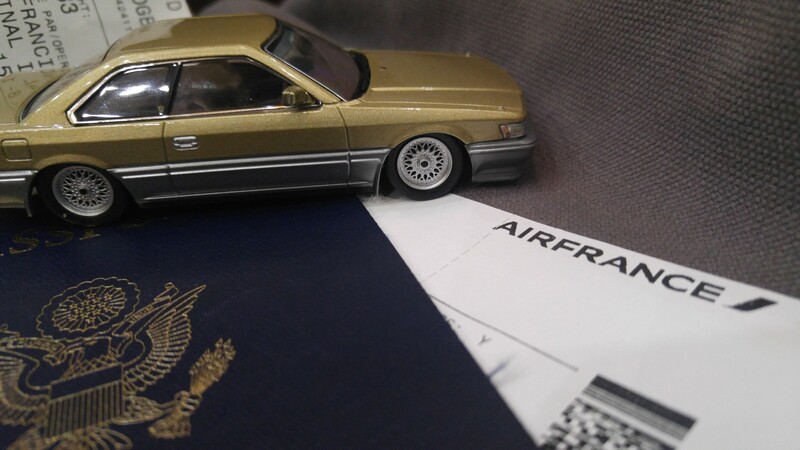 This was going to be my first time in Paris (France), Brussels (Belgium) and Amsterdam (The Netherlands). Iwan who owns an M30 convertible (and all around Nissan guy) lives in the Netherlands and we planned to meet up before I went to Amsterdam. I didn’t make it to Amsterdam and so the significance of making this trip intersect with F31s didn’t go 100%. 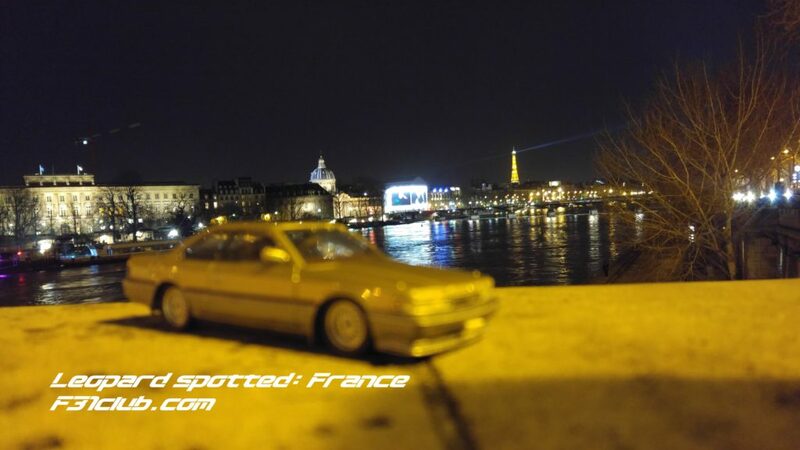 I also wanted to imagine how an F31 would be in Paris. 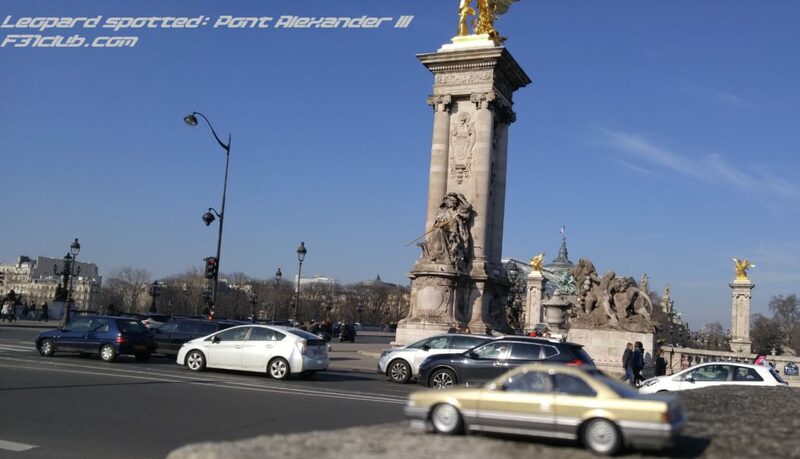 If I lived in Paris and I had my M30… I would be taking pictures in front of these iconic spots. 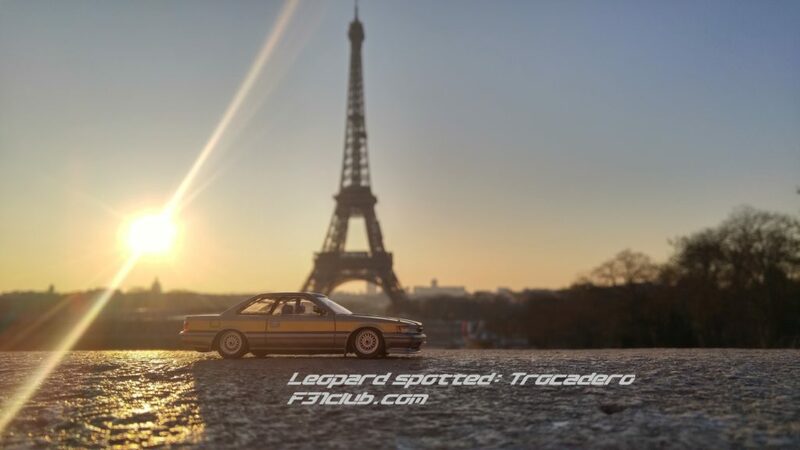 The Japanese brothers pay tribute to Abunai Deka by taking pictures of their Leopards and M30s in iconic spots from the show. 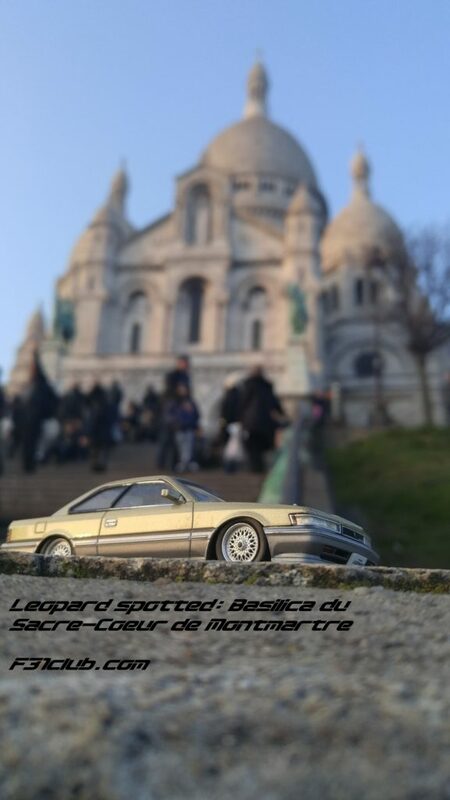 I thought about how I could do this and I remember people taking pictures of their stuff animals at cool spots during a vacation or traveling (just google stuffed animals travel the world). I figured if they can do that with a stuffed animal, why not with a toy car? 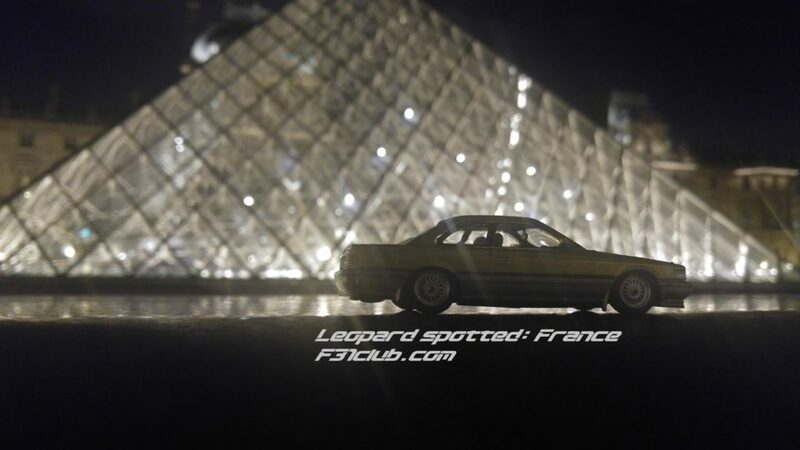 My biggest scale leopard is 1/43. 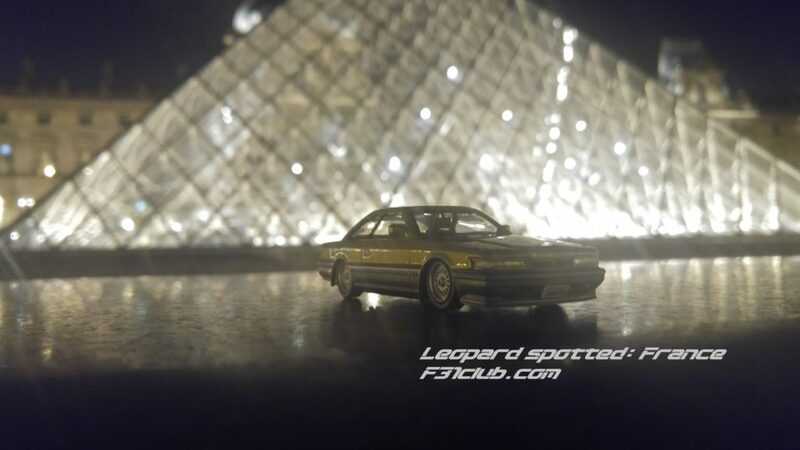 I decided to go with the Zenki Gold Leopard because it is a famous color. 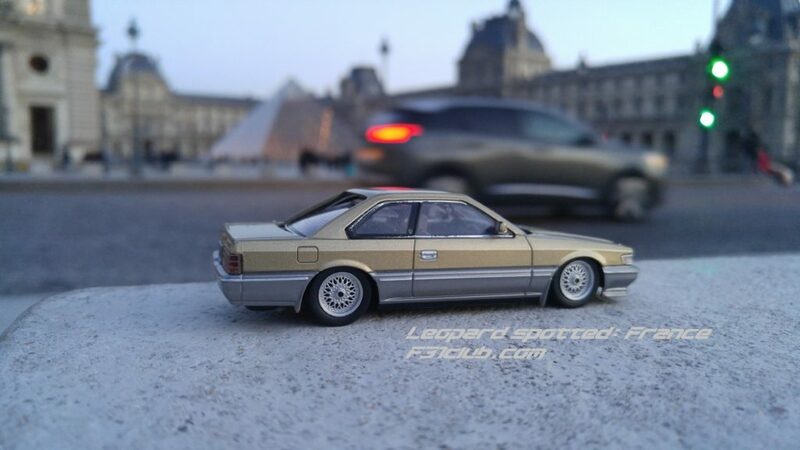 Focusing proved to be difficult as my phone couldn’t always find a balance between a small scale car and real size background. While some shots were cool, others were either blurred between near or far field. 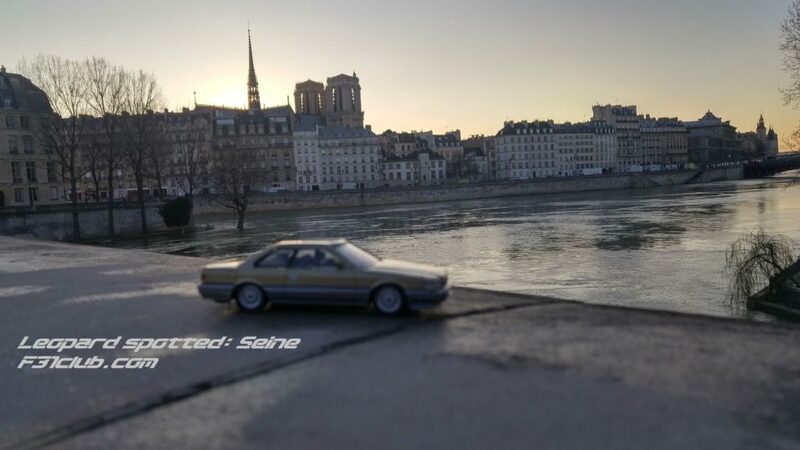 My goal was to have the car look natural and realistic. Some pictures are meant to be weird and abstract. Let’s begin! Paris can be overwhelming, there is too much to see and do! Everything looks amazing. 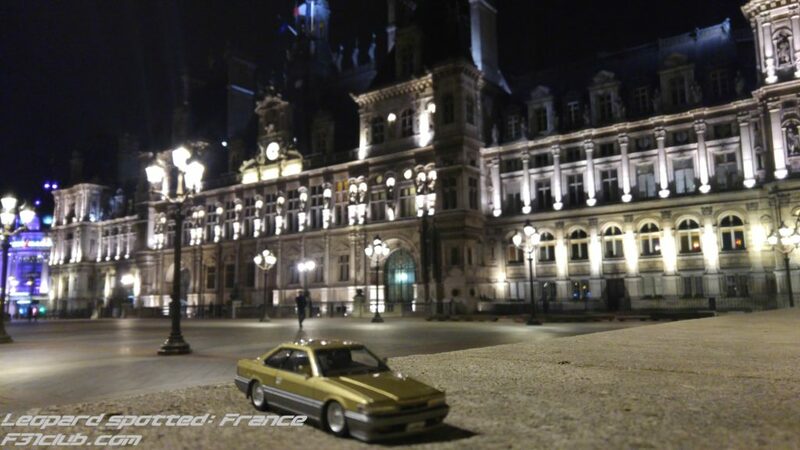 My interests are always the architecture, street art, history, historical art, city skylines, lights (Paris is the city of lights), food, experiences, public transportation, cars (no tuned car seen, but Peugeot, Reanault, Dacia, Citroen, SEAT)… pretty much Paris was eye candy. First night, we stayed in the 4th arrondissement of Paris (arrondissements are subdivided municipalities within Paris, total of 20). 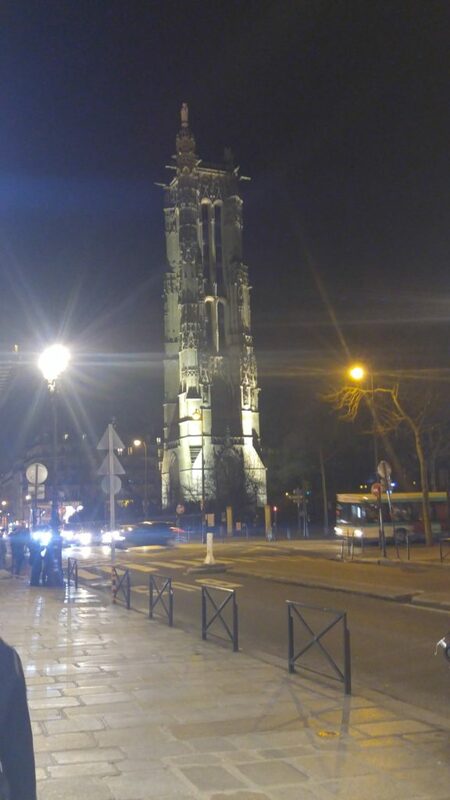 After some authentic French food and crepe, we walked around Rue de Rivoli and came upon Tour Saint-Jacques. I tried to take a picture of the Leopard, that is when I realized it wasn’t gonna be as easy as I thought. 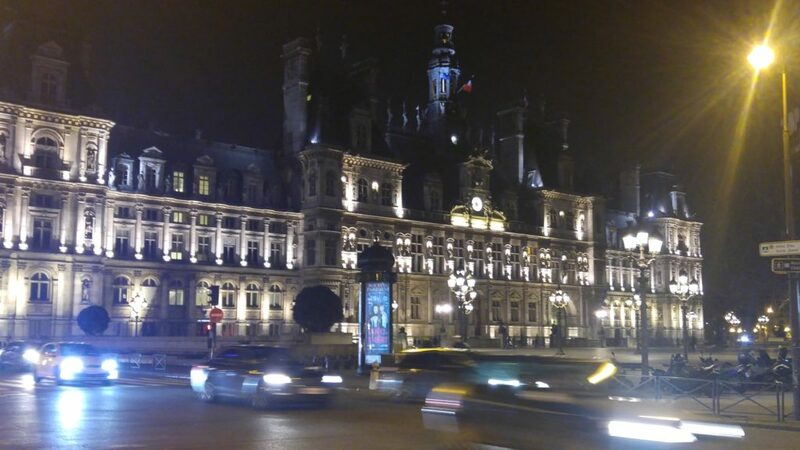 Just a couple blocks away is Hotel de Ville. 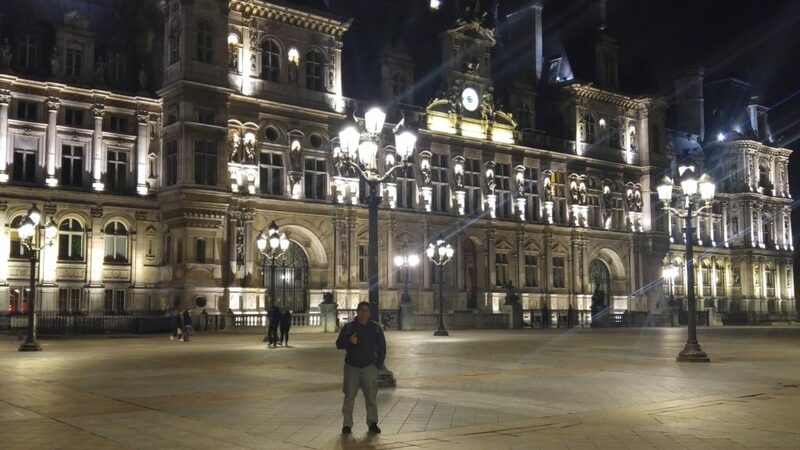 It is actually City Hall of Paris. Very gorgeous at night! While it was a chilly night, it was beautiful and so we decided to walk around along the Seine (an important river and waterway within Paris). The Seine offered a gorgeous backdrop with the Eiffel Tower in the distance. We headed towards that direction. 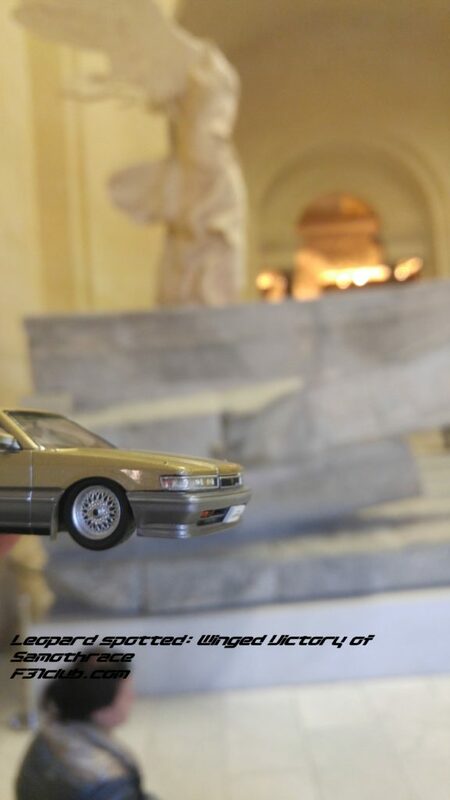 The Louvre is famous for a reason. If you are into museums, the Louvre is the biggest museum in the world. It is massive and houses so much history. I went here multiple times on this trip, but during our first night, I enjoyed it from the outside due to the Pyrimads in the Cour Napoléon. I can’t explain the inside, there is just way too much to see and they say that even a week isn’t enough to see everything in the Louvre. So I focused on seeing Greco-Roman art and sculptures, paintings of Christianity, Islamic art and of course the famous stuff. Mona Lisa and Winged Victory of Samothrace or Winged Nike to be precise. It is me being silly. 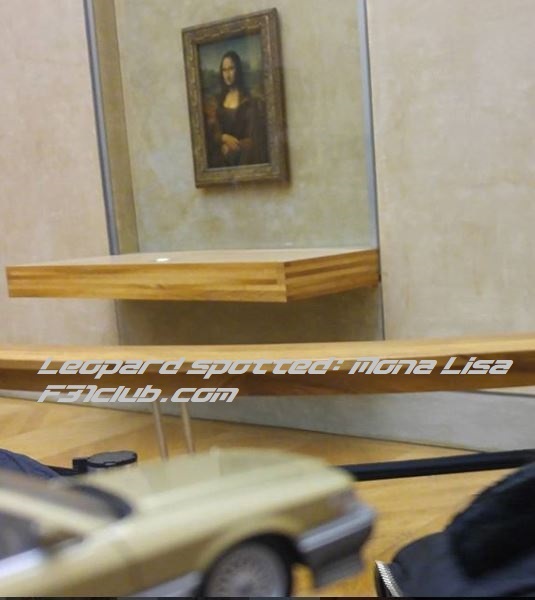 Mona Lisa is surrounded like no other. People are taking selfies and will stay at the front for a long time. I didn’t need to be directly in front, but I wanted to see it with my own eyes and I pulled the leopard out and snapped a shot. Winged Victory of Samothrace or Winged Nike is a sculpture that is celebrated all over the world. It is a sculpture of the Greek goddess of Victory, Nike! (I love mythology). Another cool and interesting thing about Winged Nike is that this is a Hellenistic marble statue and one of the few remaining Hellenistic statues around. Many are Roman copies. 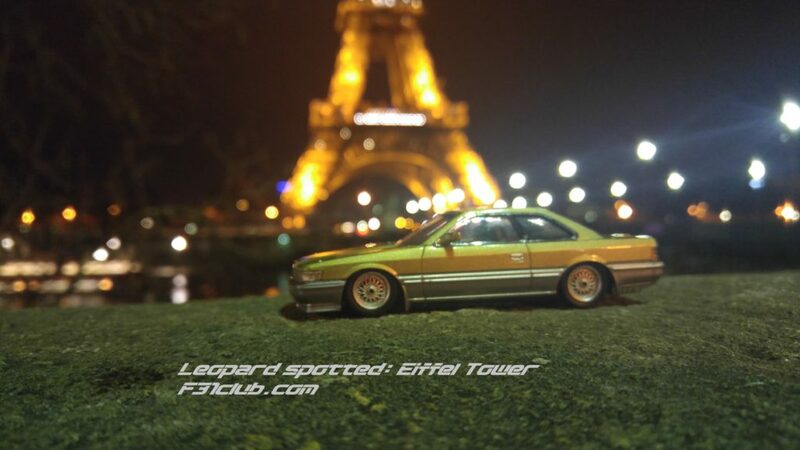 What is Paris without the Eiffel Tower? 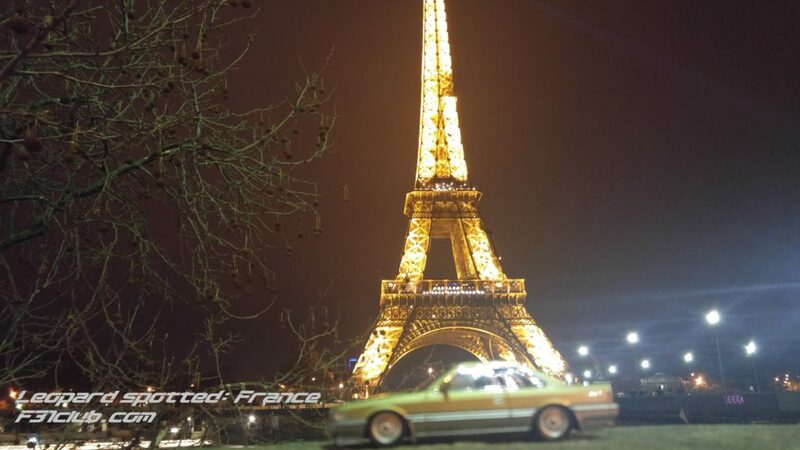 It is one of the most famous, visited landmarks and recognized all around the world! It is a great place to visit and its beauty is majestic. Pictures can’t capture its essence. I actually felt these pictures did a great job of making the leopard look realistic. Notre Dame de Paris a famous cathedral. 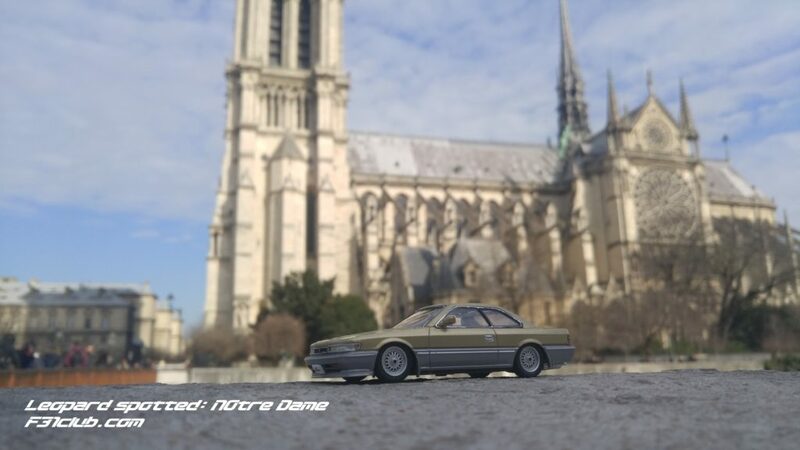 The stories of the Hunchback of Notre Dame helped bring notice to its deteriorating condition and so it was restored. Finest French Gothic design and like many old cathedrals, stained glass and even gargoyles on top! 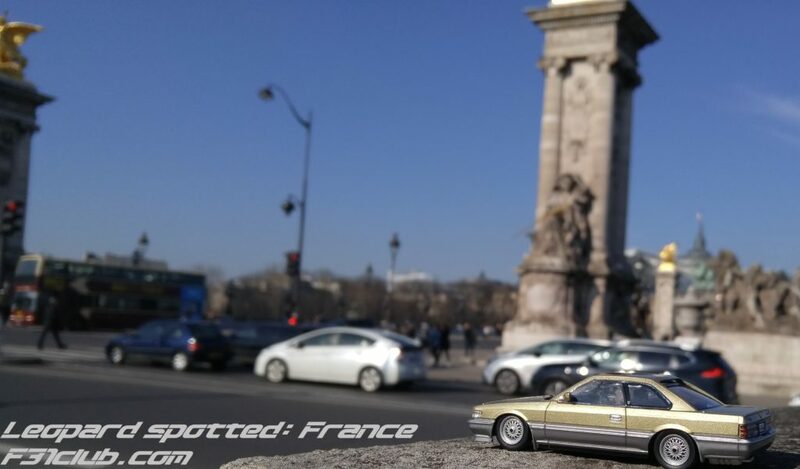 Arc de Triomphe is also one of those famous spots. While it is touristy (tons of people), it is also an amazing building, piece of art and historic significance. It is massive and going to the top is well worth it. The circle around it is also famous in many movies. 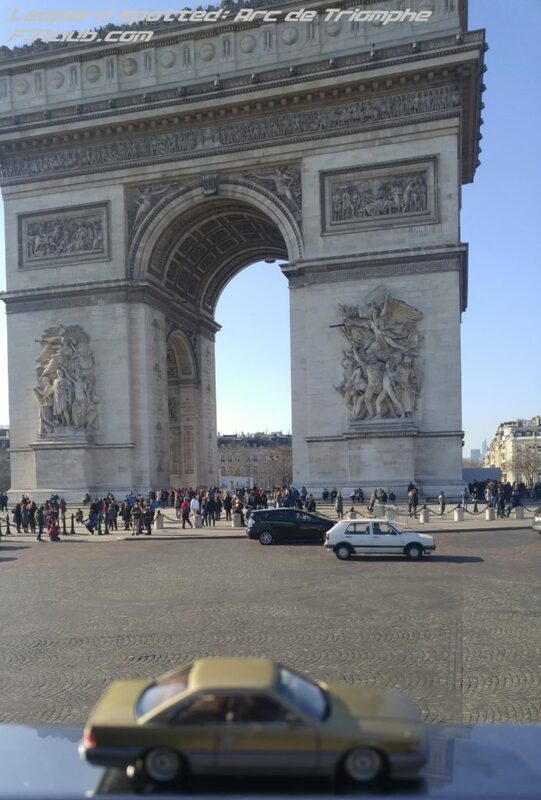 The Arc de Triomphe is at the end of Champ-Elysees. The famous avenue. 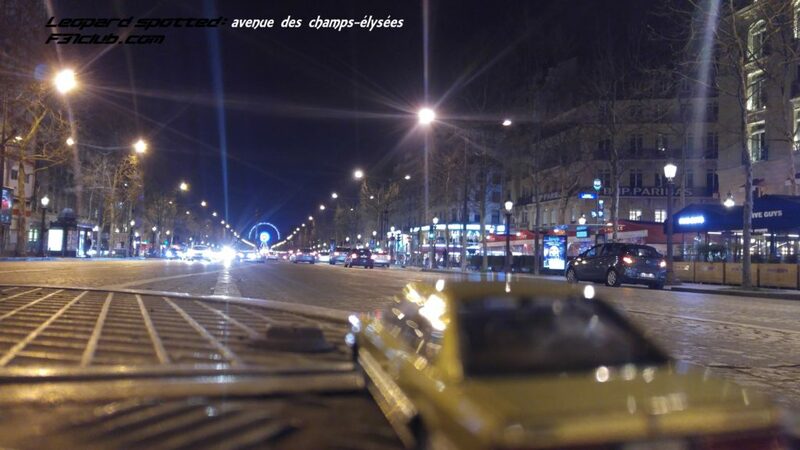 Avenue des Champs-élysées is that famous and busy avenue in Paris. This is the spot where some people go cruising. Mostly know for shopping because all the major brands are on this street. Palace of Versailles is a good 45 minute train ride outside of Paris. It’s huge, well, it is a Royal Palace. The gardens however, were just as awesome and free. The Pantheon (in Paris) was a church, but is now a mausoleum (tomb) for prominent French citizens. Very neoclassicism styled structure obviously modeled after the Pantheon in Rome. This is an amazing place if you are into Philosophy as some enlightenment thinkers are buried here. 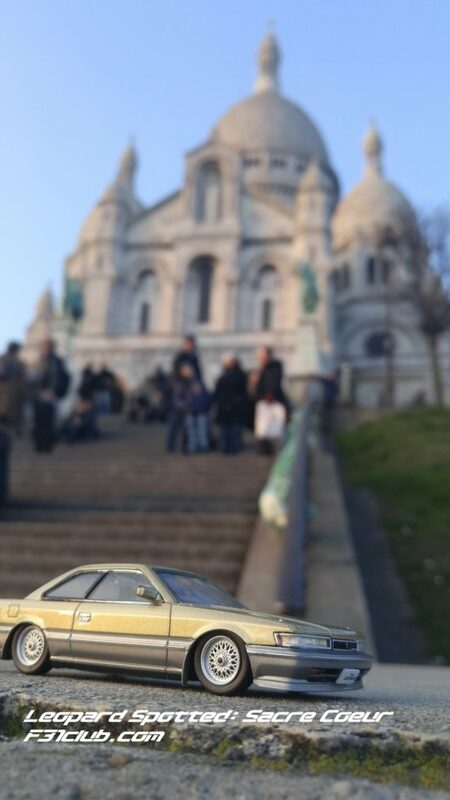 A famous Roman Catholic cathedral in Paris is Basilica du Sacre-Coeur de Montmartre, or simply Sacre-Coeur. While I did grow up Roman Catholic, I am not practicing. I go to religious buildings, temples, shrines to learn the history and art. I also go to these places being respectful of the people, culture and environment. There are 37 bridges in Paris. They all offer great views and photo ops. One of the most ornate and decorated bridges is Pont Alexander III. 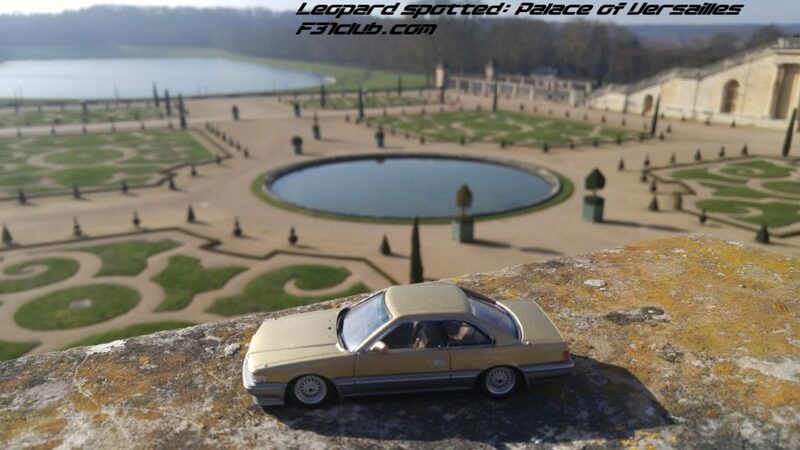 Jardin du Luxembourg is one of the biggest and well knowing open spots in Paris. 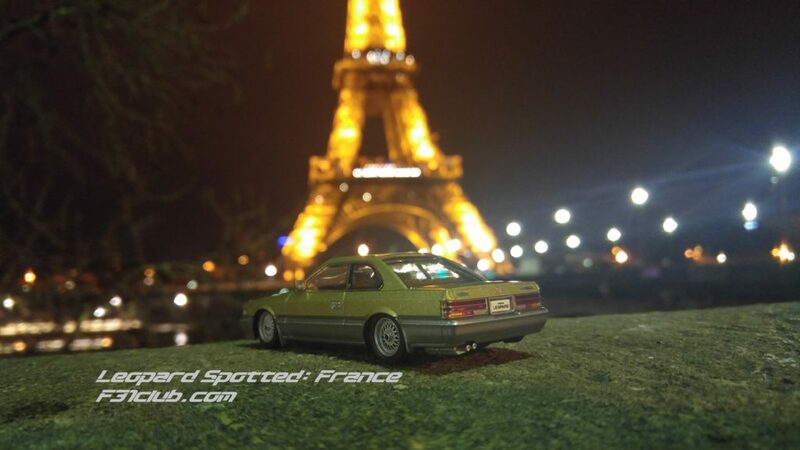 It is located in the 6th arrondissement of Paris. River Seine from Pont Marie, another bridge that crosses. Trocadero is one of those spots that you can take a great picture of the Eiffel Tower when there is no crowds (early morning or late night). Pont Neuf is the oldest of the bridges that crosses the Seine. 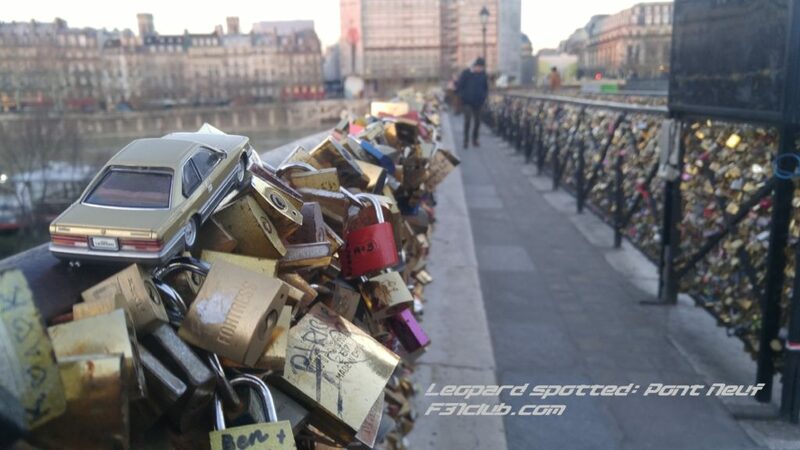 This part of Pont Neuf is the location for “love locks”. This last picture was totally unexpected. 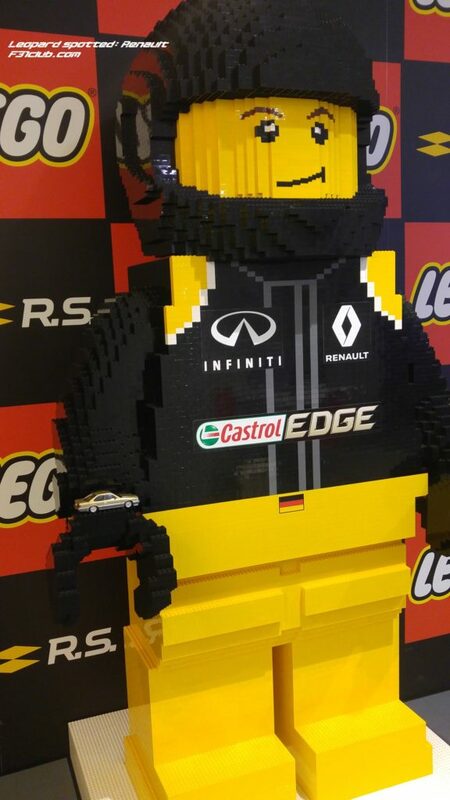 I visited Renault’s shop/restaurant to check out their Lego F1 racer. Upon going inside, I there was Infinit logos everywhere! There were life size legos people and both had Infiniti logo on their shirts. 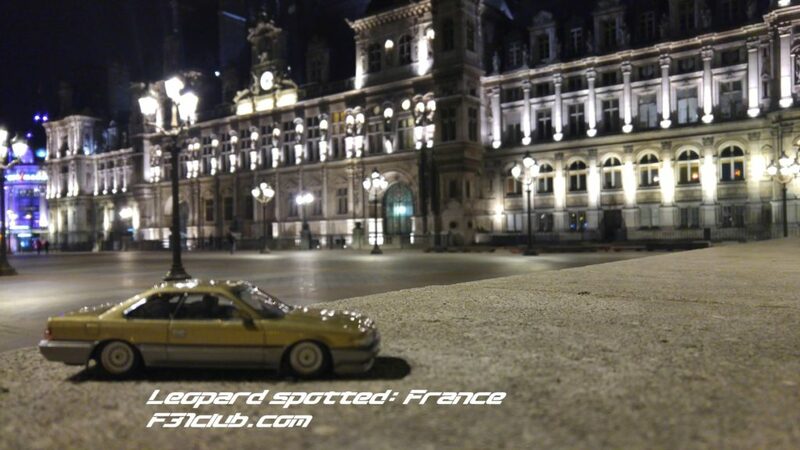 This entry was posted in blog, Meetings, opinion, scale model, toys, wandering leopard and tagged france, hotel de ville, paris.